When record numbers of queer folk descend on New York City for WorldPride this June, the famed, Milan-based retailer 10 Corso Como will help give back to the community. Among the products it stocks, the store will host a new collaborative shoe release with 25 percent of sales benefitting The Center in New York City. And though the style was created by former Gucci designer Louis D’Arienzo, the imagery on it — which features a sketch of two hands holding one another and surrounded by X’s and O’s over the word “Pride” — is by 20-year-old Michael Nieves who will also get a cut of 25 percent. For the collaboration, D’Arienzo partnered with The Center to source designs from some of its queer youth. He chose the designs with his team, after meeting the young people who created the artworks, and getting to know some of them in the process. But this, D’Arienzo hopes, is only the beginning of the work the brand will do. Launched this year, D’Arienzo’s label is meant to operate with a purpose. 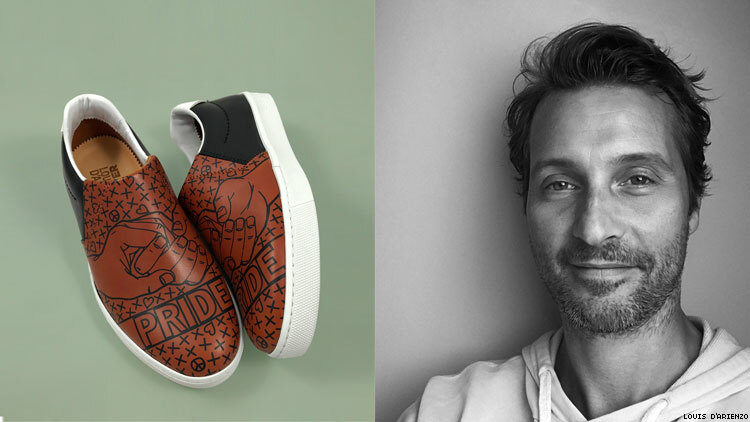 After working with brands like Jimmy Choo and Berluti (he’s currently freelancing for Ermenegildo Zegna) he launched his namesake label as a sustainable, ecologically sound venture, prioritizing those ideas in every aspect of the product. Adding message-based designs not only seems like the next logical step for his brand, but it also adds him to a long line of creatives. “You look at people like Katherine Hamnett who’s been pioneering things like this since the late ‘80s, early ‘90s...slogans, messages, getting a message out for a really long time,” D’Arienzo says. “I think it’s an effective method that’s been used by a lot of people starting with her but also including other people, like Vivienne Westwood.” But he finds giving back to the queer community particularly important. D’Arienzo’s collaboration hits stores this summer at 10 Corso Como in New York and is available for pre-order now for $260.